EXCLUSIVE NEW SKYWATCH TV & ONLINE SERIES… THE MOST CONTROVERSIAL EVER? [EDITORS NOTE: With all the talk in media today about women’s rights to be heard and treated with fairness and decency in all public platforms, Donna Howell’s timely new book boldly establishes how it was JESUS CHRIST HIMSELF that settled THIS issue a long time ago… and at a time when it would have been considered revolutionary… and prophetic! 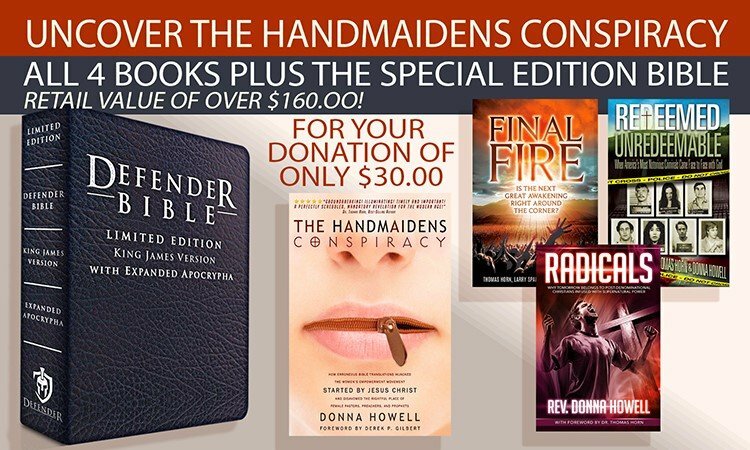 NOW…in what promises to be one of the most talked about new-releases of the year, The Handmaidens Conspiracy by bestselling author Donna Howell… the permanent changes Jesus made regarding women’s rights, their value, and their role in delivering HIS message to the world will be brought to light. This series and the book will be controversial for some and eye-opening for others. It will pit biblical scholarship against ancient and modern traditions of men. It will renew discussions about what Bible version(s) is the most trustworthy translation(s) of the original letters. Most of all, once you read THE HANDMAIDENS CONSPIRACY as I have, you will never think about the Church that Jesus Christ started… and that his apostles decreed… in the same way again! Opening remarks by Derek Gilbert, chief news anchor and broadcast host of SkyWatch Television. Women in ministry walk a tightrope. Many are led to serve, and to do so in amazing, inspiring ways. But there is a line—especially in traditional, conservative churches—that they are never supposed to cross. Paul’s first letter to Timothy seems to make it clear: “But I suffer not a woman to teach, nor to usurp authority over the man, but to be in silence” (1 Timothy 2:12, KJV). Okay, then. We don’t let women preach or teach, unless it’s to other women. If they try, we smack them back across that line—hard enough so they learn their lesson! Is that what Paul meant? Did he know about Deborah, who pushed a reluctant Barak (who told her, “If you will not go with me, I will not go”) into leading Israel to victory over a large Canaanite army? What about Huldah, the prophetess consulted by Hilkiah, the high priest during the reign of Josiah? Hilkiah went to her to inquire of the Lord at the command of the king. (See 2 Kings 22 and 2 Chronicles 34.) Think about that. King Josiah had just learned that his kingdom had been ignoring the Law for generations. He wanted to know God’s will. So Josiah, the ruler of Israel, sent the high priest, the spiritual leader of Israel, to hear the word of Yahweh…from a woman! No. More likely we’re not reading the true intent behind Paul’s words. There is context we often miss in the Bible because we live nearly two millennia after the last books in it were written. Just as a first-century Jew wouldn’t understand some of our idioms—such as “cool,” “out of left field,” or “selfie”—there are references we miss because of where and how we were raised. Then there are choices made by translators over the years, and some of the choices in translation are made by pastors and teachers. For example, consider how we handle Deuteronomy 22:5: “The woman shall not wear that which pertaineth unto a man, neither shall a man put on a woman’s garment: for all that do so are abomination unto the Lord thy God.” Some pastors take that to mean women and girls shouldn’t wear jeans, slacks, or pants of any kind. I’m all about women dressing like women and men dressing like men, but as a father with a daughter who had to wait for a school bus in Midwestern winters, the “all skirts, all the time” rule was a non-starter in my house. The key to correctly applying that verse, and every verse in the Bible, is understanding what God meant by what He said, not just our interpretation of ancient words on modern paper. And reaching that understanding means first understanding the context in which it was written—cultural and religious. Donna Howell tackles this issue because she’s been pulled out of her comfort zone in recent years. She was happy behind the scenes as researcher and writer for Defender Publishing, but something stirred in her heart. It looks to me as though God is not taking “no” for an answer as He pulls her into a new phase of her life—preaching. Some people find that disturbing. That was obvious after her recent appearance on The Jim Bakker Show. She blew away the Bakkers and the studio audience, who gave her two standing ovations: one during and one after the program. And the reception from those who heard her preach at Morningside Church not long after was just as enthusiastic (again, resulting in a standing ovation). This girl can bring it. And when she preaches, it’s from the Word. She points to Christ, and Him crucified. However, that didn’t matter to some. We at SkyWatch Television, proud to know Donna, posted a highlight video to YouTube of some of her most impactful moments with Jim Bakker. The responses, before we shut down comments, were absolutely vile. I mean insulting, inconsiderate, and in some cases, downright profane. Having come to know Donna and her family over the last couple of years, it is a joy to watch her grow into this new role. We know her well enough to say with certainty that she’s not after the limelight. Her favorite times are with her husband and their two children (who, by the way, are awesome). But she feels compelled. She can’t not do this. And yet there are some among us who insist that she should not—that by following what feels like the clear leading of the Spirit, she’s transgressing, trying to elevate herself above the teachings of the apostles, and should therefore be cast into the outer darkness. Now then, if the Holy Spirit is genuinely calling her—or you, dear reader—to preach, teach, or even prophesy, then what? In her book Radicals, Donna argued from the book of James that the Church needs a fundamental shift in the way we “do church” to reach a generation that’s growing up believing their gods are programmed and saved on silicon chips. Her point was not that we need to throw out biblical doctrine—it’s that we need to get back to biblical doctrine. We need to strip away two thousand years of tradition that has, in places, obscured teachings of the Spirit-led apostles like barnacles on the hull of a very old ship. This isn’t modern American feminism. I know Donna, and she is not about that. This is about loving the Lord our God with all our hearts, souls, and minds—and doing whatever we have to do to extend that love to the lost. It’s about context. If we get the context, we’ll get the true meaning of the Word—and we’ll find that women have been meant to play a bigger role in the Church than we’ve been taught.